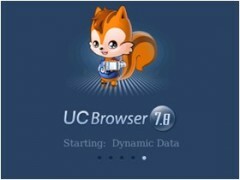 UC Mobile Ltd is on the verge of releasing their first version of the UC Browser for BlackBerrys. You can grab a copy of the release candidate at uctest.ucweb.com:9415/test/. The download page uses WML so you need to use your BlackBerry browser or another WML capable browser like Opera desktop or Opera Mini to be able to view it. 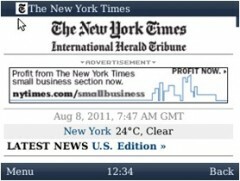 There are separate download files for Blackberry OS 4.2+, 4.5+ and touchscreen OS 4.7+ BlackBerrys. 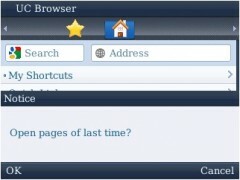 Faster – the UC Browser is a proxy based browser like Opera Mini and Bolt. Pages are pre-rendered and compressed and images are resized on the server before they are sent to the phone. This makes all proxy browsers much faster than tradional direct browsers especially on slow connections. According to the table from UC (below) their new BlackBerry browser is even faster than Opera Mini. Start Page Site Navigation – Similar to Opera Mini’s Speed Dial, UC Browser on all platforms has pre-populated start page links to popular sites which users can edit to point to their own favorite sites. Powerful download manager supporting large file downloads, multiple tasks and pause/resume – UC Browser’s signature feature, the download manager supports pausing downloads, resuming interrupted downloads and downloading files in the background while continuing to browse. It even has the ability to split large files into smaller segments to get around operator or device limits on download size. 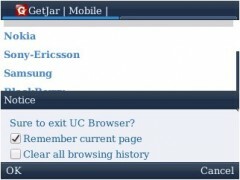 User Experience Features – the UC Browser for BlackBerry has “remember current page” and “clear all browser history” support and other features to enhance the user experience. 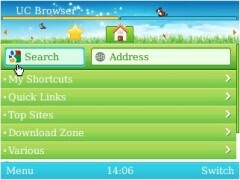 Themes – the browser supports themes with several available for download. This entry was posted in Browsers and tagged BlackBerry, UC Browser by Dennis Bournique. Bookmark the permalink. uc 7.8 doest work on my blackberry 8310!!!!!! i tried messing around with the network settings but noooo!! i want it so bad… boohoo! just found out that ucweb now limits download. sometimes if i grab files larger than 2mb, only 615kb are downloadable using ucweb. too bad.